A fine big man who contributed to success at many clubs across Tasmania during the between-the-wars period, Allan Scott’s legacy has been a long-lasting one. 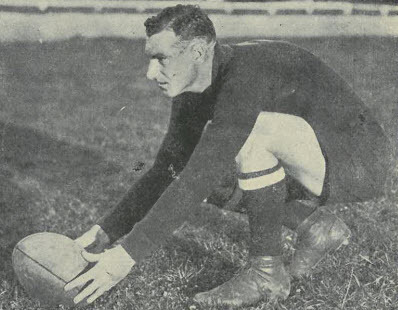 Born in Launceston in 1900, Scott made his debut for North Launceston in 1917, and soon solidified his place in the senior side as a powerful ruckman/key position player. It didn’t take long for Scott’s enormous talent to be spotted from the mainland, with both Essendon and Collingwood making overtures for him to cross to Victoria, but Scott refused. His leadership qualities had also been recognised by his club, with North Launceston naming him captain at just 18 years of age in 1919, the appointment lasting just the one season. Scott was a key member of the powerful North Launceston sides of the early-to-mid 1920’s, playing in two Robins’ premierships in 1923 and 1925. He was also bestowed with his first representative honours during this period, with Scott selected in every combined NTFA side between 1920 and 1924, and also representing Tasmania at the 1924 National Carnival in Hobart. In 1926 he left the state to play one year of country football in Victoria, and when he returned to Tasmania in 1927 he did not return to North Launceston, instead moving to Hobart to play with TFL side Cananore. He spent two years in the south, playing in a league/state premiership double with the Canaries in his first season, and making his second appearance at a National Carnival at the 1927 edition in Melbourne. After years of spurning advances from the VFL Scott finally relented, and in 1929 he joined St Kilda. He played 32 games with the Saints in two seasons from 1929-30, booting 26 goals and impressing all with his skill in the air as well as his magnificent long drop kicks. During a rare period of on-field success for the Saints, he was named as one of his side’s best in St Kilda’s semi-final loss to Carlton in 1929. Scott returned to Tasmania and to his original club North Launceston in 1931 as captain-coach, and immediately guided his charges to another NTFA premiership – his third at the club – with a 30-point victory over Longford. He made one final move in 1933, ending his playing days with a one-year stint at New Town in the TFL, again as captain-coach. A giant both on and off the field, Allan Scott’s contribution to the North Launceston Football Club was immortalised when the club’s senior Best and Fairest award was named in honour of Alan and his twin brother Don, who also had a distinguished playing career with the Robins. Allan Scott died aged 82 in October 1982.